Join electronic artist and Ableton certified trainer Josh Bess for a discussion on ideas and techniques from his new book “Electronic Dance Music Grooves” on October 24th at Dubspot LA. 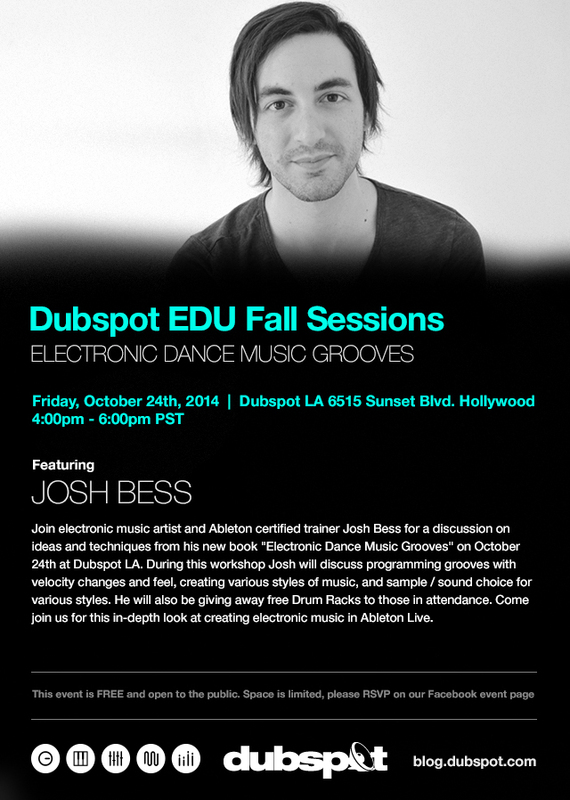 Join electronic artist and Ableton certified trainer Josh Bess for a discussion on ideas and techniques from his new book “Electronic Dance Music Grooves” on October 24th at Dubspot LA. During this workshop Josh will discuss programming grooves with velocity changes and feel, creating various styles of music, and sample / sound choice for various styles. He will also be giving away free Drum Racks to those in attendance. Come join us for this in-depth look at creating electronic music in Ableton Live. To attend, please RSVP to the Facebook event and arrive early for sign-in. This FREE event is open to the public. Electronic Dance Music Grooves provides creative insights to help you understand how to build exciting, powerful, and compelling EDM grooves. Whether you’re into techno, trance, dubstep, drum ‘n’ bass, garage, trap, or hip-hop, author, Ableton Live Certified Trainer, and noted EDM performer Josh Bess helps you take your skills to the next level with an extremely efficient and intelligent groove-making system. And, as an added bonus providing a valuable basis for you own creations this book describes the history behind the development of multiple electronic music styles. A MIDI map, designed to make it simple to use the included grooves and samples with virtually any modern DAW, accompanies each style. Whether your preferred DAW is Ableton Live, Reason, Pro Tools, Logic, or almost any of the other popular music production and performance software applications, you’ll quickly be equipped to incorporate these grooves and samples into your own creative workflow. Samples and sessions, provided to support your creativity and electronic dance music production, are delivered online to provide access to all of the content, whether you’re using a desktop, laptop, or mobile device.